St. John of Kronstadt: All our attention must be centered on the parable of the Prodigal Son. . . . This entry was posted in Sayings from Saints, Elders, and Fathers, St. John of Kronstadt and tagged Awareness of Sin, Drawing to God, Grace of God, Omniscience of God, Prodigal, Prodigal Son, Repentance, Sin, Soul and Body, Virtue on February 10, 2015 by . Canon of St. Andrew: I have sinned, O Savior, yet I know that Thou art the Lover of men. . . . This entry was posted in Church Prayers, Hymns, Services, Sayings from Saints, Elders, and Fathers, St. Andrew of Crete and tagged Divine Love, Mercy, Mercy of God, Prodigal, Prodigal Son, Repentance on March 4, 2014 by . Canon of St. Andrew: Thou art the good Shepherd . . . This entry was posted in Church Prayers, Hymns, Services, Sayings from Saints, Elders, and Fathers, St. Andrew of Crete and tagged Absolution, Asking Forgiveness, Confession, Forgiveness, Forgiveness of God, God as Creator, God as Shepherd, Lost, Lost Sheep, Mercy, Mercy of God, Prodigal, Repentance, Salvation on March 3, 2014 by . Fr. Seraphim Rose: This weekend, at the Sunday Vigil of the Prodigal Son . . . This weekend, at the Sunday Vigil of the Prodigal Son, we will sing Psalm 136. For us the Great Fast is a session of exile ordained for us by our Mother, the Church, to keep fresh in us the memory of Zion from which we have wandered so far. We have deserved our exile and we have great need of it because of our great sinfulness. Only through the chastisement of exile, which we remember in the fasting, prayer and repentance of this season. Weak and forgetful, even in the midst of the Great Fast we live as though Jerusalem did not exist for us. We fall in love with the world, our Babylon; we are seduced by the frivolous pastimes of this “strange land” and neglect the services and discipline of the Church which remind us of our true home. Worse yet, we love our very captors – for our sins hold us captive more surely than any human master – and in their service we pass in idleness the precious days of Lent when we should be preparing to meet the Rising Sun of the New Jerusalem, the Resurrection of our Lord Jesus Christ. There is still time; we must remember our true home and weep over the sins which have exiled us from it. Let us take to heart the words of St. John of the Ladder: “Exile is separation from everything in order to keep the mind inseparable from God. An exile loves and produces continual weeping.” Exiled from Paradise, we must become exiled from the world if we hope to return. This we may do by spending these days in fasting, prayer, separation from the world, attendance at the services of the Church, in tears of repentance, in preparation for the joyful Feast that is to end this time of exile; and by bearing witness to all in this “strange land” of our remembrance of that even greater Feast that shall be when our Lord returns to take His people to the New Jerusalem, from which there shall be no more exile, for it is eternal. “By the Waters of Babylon” is the entire Psalm 136, sung to a plaintive melody, after the Polyelos Psalm during Matins. It is only sung in church the three Sundays that precede Great Lent: Sunday of the Prodigal Son, The Last Judgment (Meatfare) and Forgivensss (Cheesefare) It is significant that this same hymn is chanted at the beginning of the service of monastic tonsure. This entry was posted in Fr. Seraphim Rose, Sayings from Saints, Elders, and Fathers and tagged Attending Church, Babylon, Fasting, Forsaking the World, Kingdom of Heaven, Lent, Living in the World, Material World, Overcoming Sin/Passions, Pascha, Passions, Prayer, Prayers of the Church, Prodigal, Prodigal Son, Psalm 136 (137), Psalms, Repentance, Russia, Services of the Church, Sin, St. John the Ladder, The Church, Triodian, Worldliness on February 14, 2014 by ocqadmin. St. Justin Popovich: Only the gospel of Christ fully knows the mystery of sin and the problem of sin . . .
Only the gospel of Christ fully knows the mystery of sin and the problem of sin and everything which hides within it. The prodigal son of the Gospel is the perfect example of the repentant sinner. The Gospel shows us that man, through his free will, can share his life with Earth and with Heaven, with Satan and with God, with paradise and with hell. Sin gradually strips man of everything divine in him, paralyzes his every divine inclination and desire, until it finally throws him into the bosom of Satan. And then man reaches the plight of grazing the swine of his master, the Devil. The swine are passions, which are always greedy and gluttonous. In such a life, the unfortunate man is nothing more than insane. 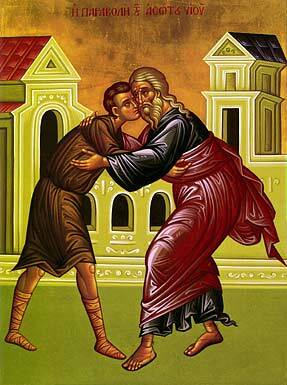 In a shocking parable of the Gospel, the Lord says about the prodigal son, ‘he came to himself,’ (Luke 15:17) How did he come to himself? He came to himself through repentance. Through sin, man becomes mad, insane. Every sin, even the most seemingly insignificant one, is always an insanity of the soul. Through repentance, man comes to his senses becomes complete again, comes to himself. Then he cries out loud to God, runs to Him, and cries towards Heaven, ‘Father, I have sinned against Heaven, and in thy sight’ (Luke 15:21). And what is the heavenly Father doing? He is always infinitely merciful upon seeing His child in a state of repentance. He has compassion for him, runs, embraces him, and kisses him. He orders His heavenly hosts, the holy angels: ‘Bring forth the best robe and put it on him; and put a ring on his hand, and shoes on his feet: and bring hither the fatted calf, and kill it; and let us eat, and be merry: for this is My son who was dead, and is alive again; and he was lost, and is found. And they began to be merry.’ (Luke 16:22-24) And this is taking place for each and every one of us, and for the sake of every sinner who repents. Namely, joy and happiness is taking place in the heaven of the All-merciful Lord and God, and together with Him, all of the holy angels. This entry was posted in Sayings from Saints, Elders, and Fathers, St. Justin Popovich and tagged Angels, Divine Love, Drawing to God, Earth, Falling Away, Falling Down Getting Up, Free Will, Gospel, Image of God, Insanity, Kingdom of Heaven, Lost and Found, Material World, Mercy of God, Overcoming Sin/Passions, Paradise, Passions, Prodigal, Prodigal Son, Repentance, Scripture Gospel of Luke, Sin, Spiritual Death, Swine, The Evil One, Theosis on February 13, 2014 by ocqadmin.